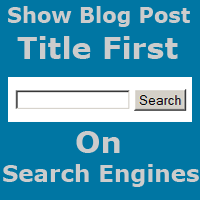 two ways to show blog post title on search engines only, for (Blogger) Blog Post Title use this methods. 3. If you want only Blog Post Title replace the above code with below code. 4. If you want only Blog Post (Title + Blog) Title replace the above Green code with this code. This tool will help you to get more traffic to your site in search engines.